Search and rescue teams in Paradise, California on Nov. 16th, 2018. 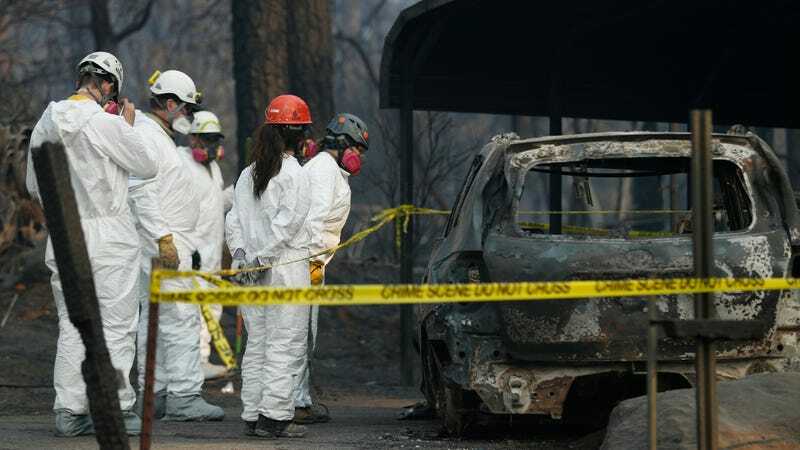 The confirmed death toll in the Camp Fire, the deadliest and most destructive fire in California history, has risen to 76, with nearly 1,300 names still remaining on an ad hoc list of missing individuals. The town of Paradise, which a firestorm overtook in a matter of hours on Nov. 8, is more or less totally destroyed. Following the lead of other fire-prone counties, Butte County contracted for a private warning system to alert residents in danger—if they had the foresight to sign up. The Paradise emergency operations director estimated no more than 30% of citizens were on the list. According to the grand jury report, the Weather Channel wrote, many vehicles carrying evacuees had an effective speed of four miles per hour. According to the Times, the main four-lane road for Paradise, the Skylane Boulevard, was designed for 1,200 cars per hour during rush hour, while almost 27,000 residents were subject to the evacuation order. The ensuing chaos saw people fleeing stalled cars on roads—one survivor told the paper her steering wheel began to melt—or simply ending up trapped, with emergency services overwhelmed and officers allegedly telling evacuees to commandeer any available vehicles. However, per the Mercury News, the sheriff’s department has conceded that they could have alerted more residents to the danger. Many reported receiving news of the evacuation too late, or not at all, due to an opt-in emergency warning system and a complicated protocol for carrying it out that moved slower than the spreading flames.